Susan Guice is a fine art photographer based in Biloxi, Mississippi. 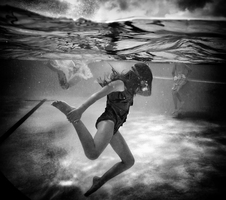 Underwater Photography and Studio combine in two new collections featuring children and exploring the freedom of water and the security of enclosure. Contrasting ideas yet closely related. Susan has been largely known for her aerial landscapes of the Coastal Waterways of Mississippi and Louisiana. These are also included in the back portfolios.